So things didn't exactly go to plan with Cert. Long story short, the rules have changed around suspension. To pass with the Cressida struts and custom knuckles the car would have to pass a bump steer swing check. After failing twice I made the call to switch back to Ae86 front struts and OEM knuckles. Pulled the trigger on some Wilwood front brakes too. So finally after a couple of months of fluffing about the car is finally legal! It looks like iforce hosting has died so I'll go back and update all my photos at some stage. Anyway time to go smash some doorts to celebrate. Thanks guys, years of working on it is coming to the finale. Car still needs some minor panel work and and new paint job in the future but for now I'm just going to drive it for a bit and enjoy some Touge. Friday update. Dropped car off at certifier the day before Waitangi day. The car only got pulled up on the way the rear brake hoses were run. (I guessed it would fail on this). Everything else was sweet. The certifier was so happy with the way it was done he brought forward the Compliance check which was done last Friday. Compliance guy had a slightly bigger list but nothing major. - Align headlights - RH wheel rubbing (center steering rack) - Bride seat fouling on seatbelt stalk (there is some adjustment to clear this) - Repair gouge on inside of LF wheel So in short nothing major! Seeing as I'm back in full swing at work I gave the guys at the cert place the go ahead to remedy everything but the wheel. I dropped this off to a trusted repairer yesterday and should get it back next week. So depending on how long it takes for the cert plate to arrive the car should be all legal within the next couple of weeks, happy days! Goal of making Toyotafest this year is looking good. Long time no post. Been working away trying to get this thing legal, work and kids with a splash of house renno really make the time fly. So as it currently stands everything is ticked off for Cert in 2 days. Got my cousin to assist with welding up the last rust holes in the doors and fixed up the hole in the exhaust. Also fitted new seat belts for compliance purposes as the old ones didn't retract well and were god knows how old. Finally took the car to K-Tech and got the rack ends all sorted out and a cert wheel alignment done. I had to raise it up about 10mm to accommodate the 205/55/14s which are the legal tyre on a 7.5inch wide rim. I even pulled it out this afternoon and gave it a clean and polish so it looks tidy for the Cert man. Finger crossed that it doesn't come back with a 3 page list of things to fix! More progress over the weekend. Car is pretty much sorted now for the Track day just need a wheel alignment now. As for getting it legal I will leave most of that till after Taupo now. Fitted up the larger of the AE86 accelerator pedals. Mine had the smaller plastic one which was useless for heel-toe action. Ive since painted it black. Also finally received my replacement Speedo driven gear, I ended up buyng from Amayama as it was half the price from local Toyota dealer. The one I had was 33/10 (driven gears/drive gears) the replacement is 35/10. Slammed it in and now the Speedo is pretty much bang on. Also made a last minute purchase of Cusco front and rear swaybars, we installed them over the weekend and man do they make a difference! I just need to find 20mm rear swaybar bushes in Prothane/Nolathane. The ones that came in my bush kit only go up to 16mm I think. Factory rubber ones will have to suffice for now. Cant wait to give this thing a good thrash at Taupo now. So long time no update. Have been chipping away at the minor things over the last year to get this thing closer to being road legal. Not too many things to go to get legal but have been working on getting it track ready for this Octobers Jerkfest track day. Finally got the Bride Brix mounted up and sitting at an acceptable height. Also picked up a TOM'S ECU - makes a fair amount of difference to mid range torque compared to factory ECU. Also removes speed cut and up rev limit to 8400rpm. Found some new/old stock Pioneer parcel shelf speakers. Got around to undersealing the whole bottom of the car and also made up some driveshaft loops. Also painted the gearbox crossmember and shortened the studs on the runner mount. Also managed to do a few more bits like fitted rear the swaybar, bought some Direzza ZII Semis, fitted AE86 accelerator pedal. Did Cambelt,Water pump etc also. As it sits currently: So the list to get it legal currently stands at: - NSDT cert for the front struts - Fit new speedo pickup - Fix rust spots in doors - Replace seat belts - Fix hole in rear muffler - Align Headlights - Do skids (oh wait, too late) Im aiming to drive it to Leadfoot this year so I better get cracking! Hey man, yes it's great it's finally going after all this time. 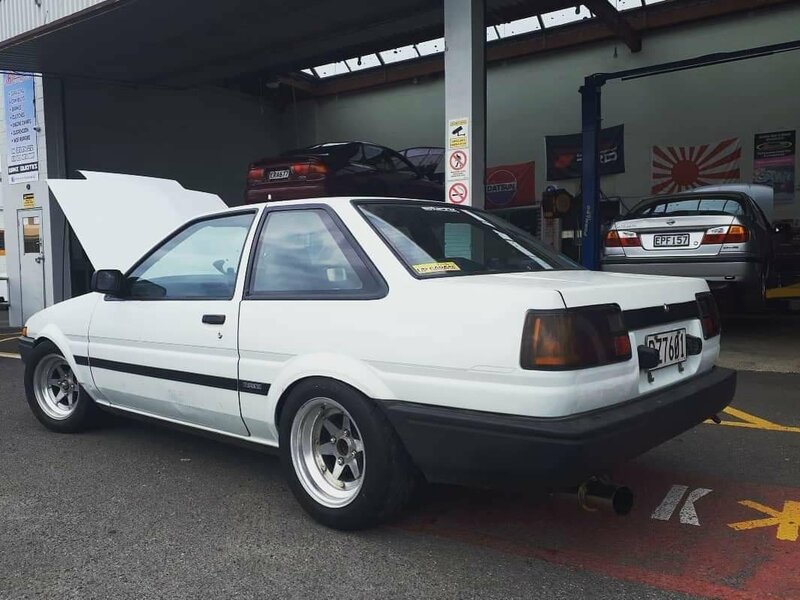 I still have a lot of work to get it road legal but will work over summer on this and hopefully be able to attend some of the ae86 meets! Here is some raw video taken in car (using my phone and a windscreen mount haha). So a crap load of hours went into this thing in the lead up to last weekend. I didnt document everything as it was full on trying get everything ready. Finally got the trumpets tacked on to the flanges and tidied up engine bay as much as time would allow. Had to wrap the extractors as they are way too close to the starter motor and under bonnet temps were getting pretty high. Turns out my Japan spec tyres on my rims were dodgy and one blew out during a spirited test drive. So Jordan lent me his Longchamps and I threw my tyres on. Great thing is I now know that 7" on the front and 7.5" on the back is pretty much perfect. Took it for a wheel alignment and setup as per what I though would be the best spec for a track grip session. Its running -1 Camber, +3.5 Caster and .5 Toe out each side. Thanks again to Jordan and Kelvin for helping me out getting it all ready! Did a bit more work today tidying up wiring. Still more to do but its starting to look pretty sweet. The AE111 fuse/relay box looks pretty factory too. Threw the door and guards back on and took it for another doort up the road. Badly needs a wheel alignment. So a few finshing touches and it should be all good for Taupo. Will post some vidoes up of test drives soon. What a week. Things have progressed quite quickly this week as we worked on the car most nights till midnight. So it was a huge effort on the wiring front, AE111 relay/fuse box is mounted in the bay and everything plugged in as it should. Connected up DLI box to run the Coil on plug setup too. Thanks to Jordan for all his hard work here. Will post some pics when I have some decent lighting (ie: not midnight) The extractors I had must have been modded for a Starlet or similar as output flange was fouling on floor. Thankfully I had Kelvin on hand to modify flange plus make exhaust go under diff and mount my Apexi muffler. Mounted the Fuel pump and pre filter, bent up some lines and ran wiring for pump. Did some fuel system tests, had a couple of leaks but just needed some tightening up. Im using the original breather line as main feed and main feed as return. The original return line is too tiny so may use it as a breather and keep charcoal canister up front to retain that 80s spec look. Fired it up and moved it outside under its own power!! almost 5 years of ownership and its finally running. So we took it for a quick drive to test everything out. All I can say is Wow! it exceeds my expectations. Engine pulls nicely and 6 speed with 4.3 ratio keeps it on cam. Suspension feels great, tight but not harsh. Diff is super tight, can confirm it twin spins nicely. Also exhaust sounds pretty sweet, not too loud as I still want to hear the doorts from the bay. Brakes need some bedding in but pulls up really nice. So a list of things to sort before track day: - Fit doors - Wrap all wiring - Mount ECU and DLI box - Sort clearance of extractors to starter motor - Fit bonnet - Fit trumpets and profit from all of the Doorts Will post up some photos of wiring etc after I go out today. Hey man, thanks for the feedback. Yeah it's progressing quite quickly now. Started it last night! Trying to get it going for track day next weekend but we will see. Def keen to link withere like minded 86 owners, watch this space. Should be posting up more progress over the weekend. So... Long time no update. Have still been working away but have not had time to post up anything for a while. Finally got the Cusco LSD head installed and setup, I requested a solid pinion spacer rather than a crush tube which will hopefully hold up strength wise. Its super tight! Then pressed the bearings onto the Axles and fitted it all up. Lastly before it went into the car I had to sort Brakes. I made the decision to sell my MA45 brakes and copy what they use on the N2 cars in japan, its using AE101 calipers and the handbrake cables clip straight up. Also picked up a short shifter for those gearbox shattering quick shifts. So last weekend we towed it out to my mates place to start the wiring mission. This is the first time I have laid eyes on it from a decent angle and it looks pretty sweet! Wiring mission has commenced. Plan is to run the AE111 Engine loom and use the AE111 relay and fuse box so it all looks factory. Will post pics once its mounted. So I have a small list of stuff to sort out before it can be started. - Mount Fuel Pump - Sort Fuel Hoses - Find Radiator Hoses - Tidy up exhaust - Mount seats properly All going well I should be able to start this thing by the end of this week. Just checked out the progress, I like very much! Nicely done RX3 and now with more Japanese flavour.